The CDI 5450 is a hot tap compressed air flow meter is a modified version of the 5400 compressed air flow meter. The 5450 model allows for installation to be done without shutting down the compressed air system. The base assembly of the flow meter includes two valved ports for the probes and a muffler to collect the chips from the drilling process. The flow meters provide a local display of compressed air flows with 4-20mA and pulse outputs, plus the option of Modbus RTU outputs. The flow meter consists of a base assembly that clamps onto the pipe and the flow meter locks into place to the base assembly for a secure seal once installed. 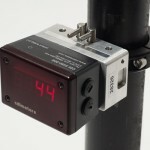 Flow meters are suitable for pipe diameters from 2" up to 8". The installation process consists of clamping the base assembly in place, drilling holes through two valves in the base plate using the supplied drill guide. The seal plate and filter assembly ensure a good seal to the pipework. The meter assembly then snaps into place and is finally secured with two safety screws. It takes about as long as installing one of our 5400 meters and does not require a system shutdown and a pressurised system will help ensure chips are collected by the muffler. Further details are provided on the installation video below and the product page on our website. The datasheet and further information can be found on the main CDI 5450 page.